Apple had recently announced the Apple Music, Apple’s very own music streaming service and all we know about it is that it is going to compete with other music streaming services like Saavn, Gaana, Wynk and others in India as India is an emerging market, but then we got how Apple is planning to compete and beat others in terms of pricing. 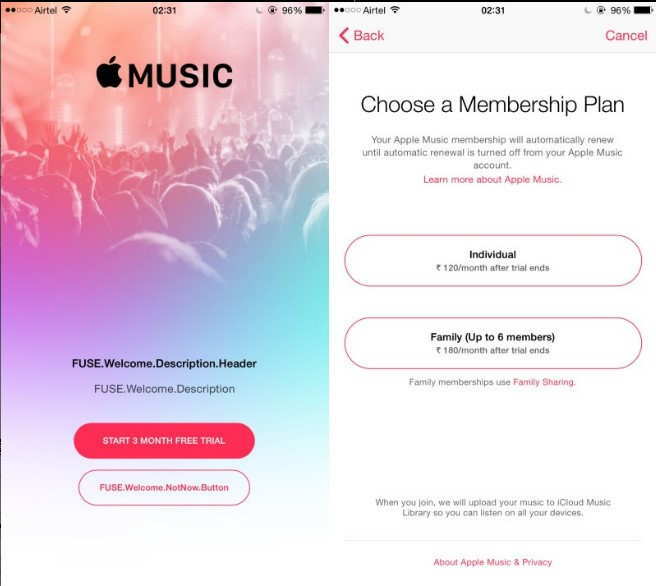 A screenshot from a beta tester reveals how they are going to set up pricing for the Apple Music in India, it’s just Rs. 120 or $2 in India after the trial period is over. With this kind of pricing, Apple Music seems to be able to easily beat other streaming services and many of its rivals in India like Rdio, Gaana and Saavn. The rate is much lower than what you need to pay for Apple Music in the US, which is $10 or around Rs. 600, so looks like Apple is going for a huge 80% price cut in India to capture the market. Most of the Indian streaming services have a huge catalogue of Indian music, but smaller one in case of international music, so looks like Apple is going to fill that blank space and offer a huge collection of every kind of music at a price which is very close to Indian music streaming services. For example Gaana charges Rs. 99 per month for its ad-supported service and Rs. 199 for ad-free playback, while Saavn’s monthly rate is Rs. 120 for its ad-free Lite plan. The screenshot also shows the availability of a Family plan that costs Rs. 180 (about $3) a month for up to six users, as well as a three-month free trial period. Great deal, huh? Guess we will see Apple Music in action very soon in India, capturing every single Apple user who used to go for Indian music streaming services.